Who's Feeling Young Now? is the Punch Brothers' third studio album, following the filming of their documentary, How to Grow a Band. People are afraid of bluegrass. Most people are a little uneasy around it and even if you say you like bluegrass, chances are you probably don’t. Not to be too brutally honest, but bluegrass is so different from any other type of music, just like metal. It’s a wonderful genre filled with virtuosos galore, yet it’s underplayed or played ironically. The Punch Brothers are doing something with the genre though. They’re making it approachable while not straying too far into country or jam band territory; they bring the best of every genre and meld it into an unstoppable, catchy juggernaut. You may even recognize one of the members if you’re familiar with country. Chris Thile originally was Nickel Creek’s virtuosic mandolin player with a lovely set of pipes-that is until Nickel Creek went on hiatus. Nickel Creek was the talented, neglected sibling of the country world; they won awards left and right for their beautiful melodies and ballads, yet never made it to Toby Keith status. After the band went their separate ways, Thile headed off in the solo album direction. Thile ended up “growing” a band in 2006 when Thile met the rest of the Punch Brothers when they helped him record his debut solo effort. Since then, the Punch Brothers have been extremely busy touring and recording (they’ve recorded three stellar albums in three years). The Punch Brothers pride themselves on writing traditional bluegrass with a classical and pop twist, albeit a very interesting combination, but it just works. Thile was the mastermind behind the Punch Brothers’ debut album Punch, where he showed off his four part classical-bluegrass movement about getting a divorce from his wife called “The Blind Leaving the Blind.” Each of the four parts clocks in at over 5 minutes and are impressive, breath taking and relaxing. Since then, the Punch Brothers have become more audience-oriented and have written catchier, less-bluegrassy songs, which for some is alarming. For new Brothers fans it’s quite attractive. It also helps that Thile is a massive Radiohead and Strokes fan, which allows for some awesome live Radiohead and Strokes covers (check ‘em out on NPR’s exclusive performance). 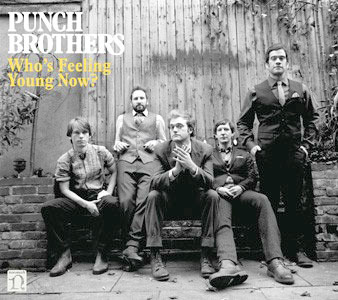 The Punch Brothers’ newest album Who’s Feeling Young Now? is lavishly textured and earthy. It’s funky and bluesy. It’s catchy and calming. It’s cascading and heart-warming. Thile writes his lyrics with emotion and care and matches it with a graceful mandolin. Without his band, though, Thile is one-dimensional. Noam Pikelny on Banjo, Chris Eldridge on guitar, Gabe Witcher on fiddle, and Paul Kowert on double-bass give the band life and flesh out each song with tasteful melodies and chords. Who’s Feeling Young Now? is a perfect representation of the Punch Brothers’ style and feel. Songs like “Patchwork Girlfriend,” “No Concern of Yours,” “Don’t Get Married Without Me,” and “Who’s Feeling Young” are calming, upbeat bluegrass pieces and scream Punch Brothers’ originality. Songs like “Hundred Dollars,” “Kid A” (a Radiohead cover), “Movement and Location,” “New York City” stick out though. These songs are brilliant and building. “Kid A” is intense and rife with tension and release as the Punch Brothers recreated the fantastic Radiohead song in their own way. “Hundred Dollars” grooves like no other and feels like a blues-rock song. “New York City” is a blazing fast piece that is layered and lush with Thile rushing his lyrics; it’s definitely a favorite of mine. “Movement and Location” is progressive and constantly building until the very end of the song. From beginning the end, Thile and the rest of the Brothers weave a beautiful amalgam of sounds and genres. The Punch Brothers have diverged from their original classical-tinged bluegrass arrangements to reflective, canorous, sublime arrangements that are approachable by nearly anyone. The Punch Brothers don’t cease to impress on Who’s Feeling Young Now? so maybe they will get the attention they deserve? Who knows who will hit the top of the charts with Adele gone from music for five years?